What do I think Pope Francis should do when he comes to the United States next year? A lot of excellent possibilities have been raised so far, but I’d like to push in a little different direction today. When Benedict XVI came to the US in April 2008, he presided over masses celebrated in Nationals Park in Washington, DC and Yankee Stadium in NYC. His predecessor, John Paul II, presided over masses in Yankee Stadium, Shea Stadium, and the Edward Jones Dome in St. Louis. Plans for Francis’ 2015 visit are rumored to include stops in NYC, Washington, DC, and Philadelphia. With more than 10 pro sports arenas/fields/stadiums between them, it seems almost certain that Francis will preside over a mass or two at one of these locations. But I’d like to encourage Francis to consider attending a game in one of these locations too. Since it is tentatively planned for September 2015, he’d have the option of seeing the opening weeks of the new NFL season or the waning days of the MLB as teams fight for their playoff spots. 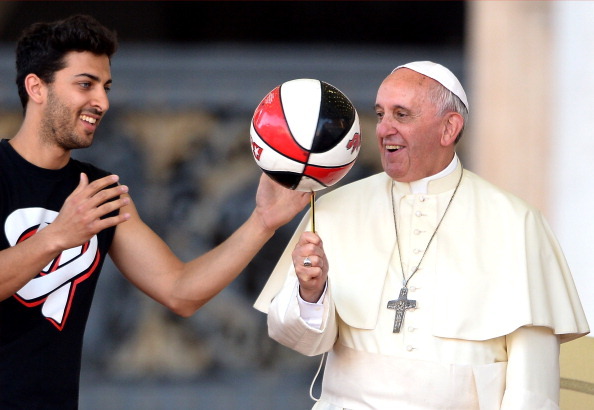 Why should Francis take in a game? First, sports feature prominently in US culture. In terms of television viewing (that great barometer of US culture), ESPN is the second most watched cable channel while the Super Bowl is the most watched event on TV in any given year (the 21 most watched events on TV in US history have all been Super Bowls). Beyond the TV indicators, sports are a widespread aspect of youth culture, from little league through high school and into college. This is not to say that all kids play organized sports (although many do), or even that all kids are affected by them. Nonetheless little league is not only a common rhetorical reference for the innocence of youth, but it’s playing sports is common enough that more than half of US children participate to some extent. At the high school and college level, sports often serve as one of the proxies representing a school, its ideals, or its significance. Finally, beyond the pervasiveness of sports on TV and in schools, sports-related idioms and metaphors are widespread in the English language. “Saved by the bell,” “roll with the punches,” “end run,” “punch drunk,” “time out,” and “hitting a home run” are among the many terms that began as sports references but have taken on commonly recognized figurative meanings (most infamous among these might include George Tenet’s claim about WMD in Iraq being a “slam dunk”). Secondly, there is arguably an important interrelationship that one can see between sports and religion in the United States. This goes beyond Al Michaels’ “do you believe in miracles? !” during the 1980 Winter Olympics. NFL football has become a different form of “Sunday observance” for the 64% of Americans who watch (or even attend) games. There are numerous attempts to interpret sports through ritual and liturgical lenses. Others might argue that there is no better example of the theological virtue of hope than Chicago Cubs fans who, year after year, pull for their team to finally break the curse of the billy goat and win a world series. Some might characterize their allegiance to their teams as a form of devotion. This can be especially true for fans who move away; for myself, my attachment to the Indianapolis Colts and the Indiana Pacers helps me to remain connected to my hometown. This connects to common experiences of community that form around sports, whether that be the esprit de corps that teammates share with one another or the bonds that tie fans together in stadiums and sports bars. (For more on these and similar connections, one might consider checking out Jeffrey Scholes and Raphael Sassower’s 2013 text Religion and Sports in American Culture ). Third, and perhaps most pertinent to what’s going on now, sports are also a place where many in the US experience brokenness. Recent controversies include domestic abuse in the case of NFL running back Ray Rice and his now-wife Janay Rice, the ongoing issue of the Washington NFL team and their racist team name and mascot, justice with respect to college athletes and their treatment, and the conflict of interests inherent in much sports media. None of these situations is entirely unique to sports or to particular organizations – domestic abuse, racism, just wages, and honest reporting are issues found elsewhere in our country. Yet these events, when they arise in popular sports, present an opportunity to focus the conversation and our efforts towards finding solution. They serve as profound and provocative examples that highlight the brokenness in our society more broadly. As an example, consider Nationals Park, where the MLB team the Washington Nationals play and where Benedict XVI celebrated mass in 2008. The park was built from 2006-8 in the southeast quadrant of Washington, DC, which is widely characterized as both poverty and crime stricken (during my time at Georgetown University, I recall being regularly discouraged from heading there for nearly any reason, volunteer work being about the only exception). Estimates of the cost to the city for this park are $675 million for construction (which was financed with $140 million upfront and $24-32 million annually in debt servicing), $82 million for transportation improvements (particularly work on the DC Metro), and $1.5 million/year for maintenance. Some will argue that building such a stadium and bringing in a team will improve the economic situation through tourism, hotel rentals, restaurant receipts, etc., but the research both on Nationals Park and sports franchises in general makes this claim highly questionable. This is even more at issue when public money is used to pay for stadiums but the private owners of teams receive tax concessions, relatively cheap rent for the space, and an overwhelming share of the revenues. Of course, having a team can bring pride or culture to the city, which is difficult to measure or quantify, but this only pushes the question to whether or not these values genuinely contribute to the common good of the city or region. With Nationals Park, it’s hard to see how bringing the team to town and laying out so much public money for it will be a positive move for the wellbeing of residents of the DC metro area. Ultimately, I think Francis should take in some games here for all these reasons. Sports are a big part of US culture; sports can inculcate positive virtues like integrity, fair play, and communal commitment; and sports can magnify our attention on the sinful, broken aspects of our culture. As a leader and pastor who wishes to “smell like his sheep,” Francis could get a bit of that smell on himself by meeting athletes and their fans. And to be clear, so far I’ve mostly talked about professional sports, largely because of the sheer scope of their influence. Pope Francis, you are more than welcome to come down here to Saint Leo University and take in a game with our student athletes or to play some intramural games with students and professors. While you’re in New York, there are plenty of pick-up basketball and baseball games that would be happy to have you. Working up a sweat on court with your flock is certainly one way to get the smell of your sheep on you.